Derek and I have something in common with Stampin’ Up! We both celebrate our 30th anniversary this year. Our anniversary date is November 5th. However, as our anniversary drew near we realized that I would be in New York on that day, so we decided to plan a celebration in October. Derek and I love to travel the world. Since he works extremely long hours at work, especially in this season, we appreciate the quality time we get together when we travel. 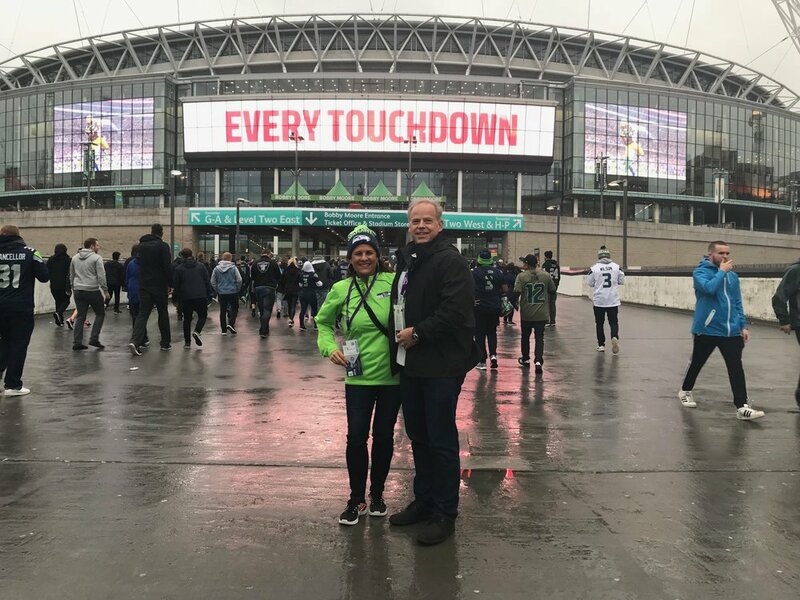 As we discussed where we wanted to do for our anniversary, the choice was easy when we heard that the Seahawks would be playing a game in London! I had been to London before but it was one of the places on Derek’s bucket list that he wanted to see. So off we went to explore London. Here are some of the fun things we did while we were there. We visited Buckingham Palace, London Bridge and the Tower of London. We saw the Crown Jewels and met a few Beefeaters who had lots of interesting stories to tell. The weather was gorgeous. There were blue skies almost every day and we enjoyed walking for miles every day, exploring the city. We visited Harrods one evening. It was so beautiful at night with all the lights! We went to see two Broadway shows, Les Miserables and Hamilton. Both were fabulous. We walked through many beautiful parks and gardens. We especially enjoyed the leaves and seeing the changing colors that we don’t get to see in Hawaii. We visited Windsor Castle. There had been a Royal Wedding there the day before so we enjoyed seeing some of the remnants, such as beautiful flowers that were still in the chapel. While I was there, I got a message from my friend Natalie asking me if I was going to shop at Cath Kinston. I asked her, “what is that”? She acted surprised and excited to tell me that it was her favorite store and she thought I would love it. 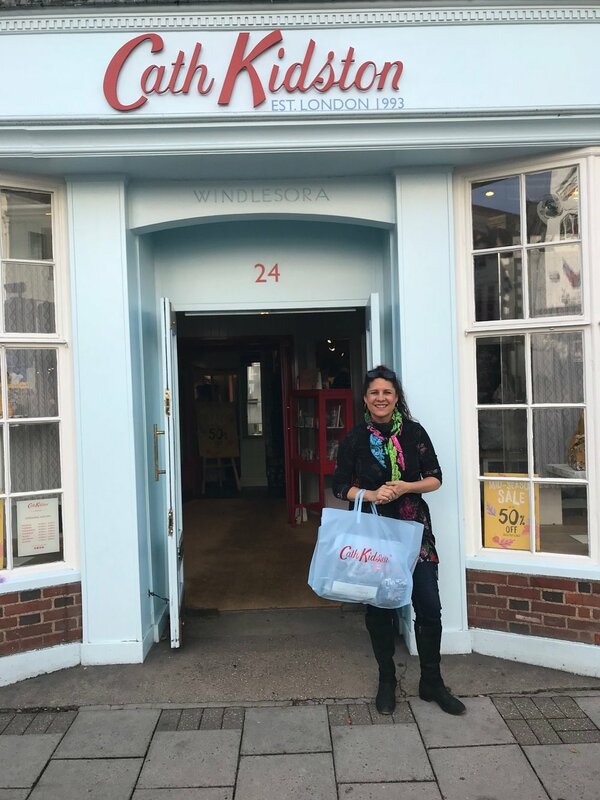 So, we looked up the store and oh my, she was right! I loved this store. I loved it so much that I visited 4 locations all over the city over the next few days. I was so appreciative of this great travel tip. I did quite a lot of Christmas Shopping while I was in there cause they had such cute things! On game day we went to church at Hillsong London . These brothers from Germany sat by us, wearing SeaHawk jerseys. I asked them, “Are you hear to pray for a victory today”? It was fun to meet these young, enthusiastic, German fans. After church as we got ready for the game, suddenly the weather shifted. It became cooler and a little rainy. It actually made the experience even better. So we got bundled up and headed to the train that would take us to Wembley stadium. On the train we met a group of young girls that had Hawaii ties. They were SeaHawk fans too and they told us a story on how the day before they had met Marshawn Lynch at a department store and got to take a photo with him. How cool is that? I love football and watching a team play live is so exciting. I was so thankful to have the opportunity to be at this game with Derek. We had SUCH a great time in this very exciting atmosphere! Even though it was a Raiders home game, there were a lot more SeaHawk fans present. That meant that the cheering was very loud and the icing on the anniversary cake is that we won that game. It was my kind of game too!! The final score 27 to 3. Since I was unable to be with Derek on our actual anniversary, I made him a card and left it with Jess to give to him on November 5th. Here is the card I made for him using the stamp set Peaceful Place. 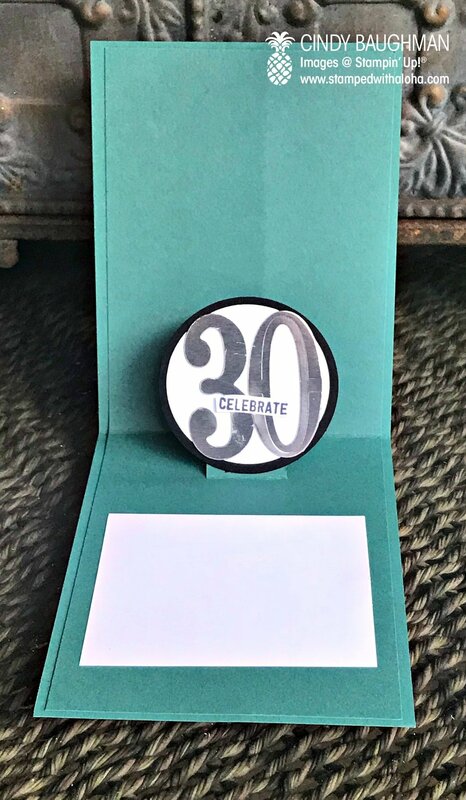 I popped up a section on the inside to display a die cut #30. Jessica texted me this photo of Derek moments after giving him his card. She took him out to lunch that day. I am so thankful for Derek. He is truly an amazing husband, father and best friend. Happy 30th Anniversary, I am so grateful to God for the blessing of having you by my side as we journey through life together.